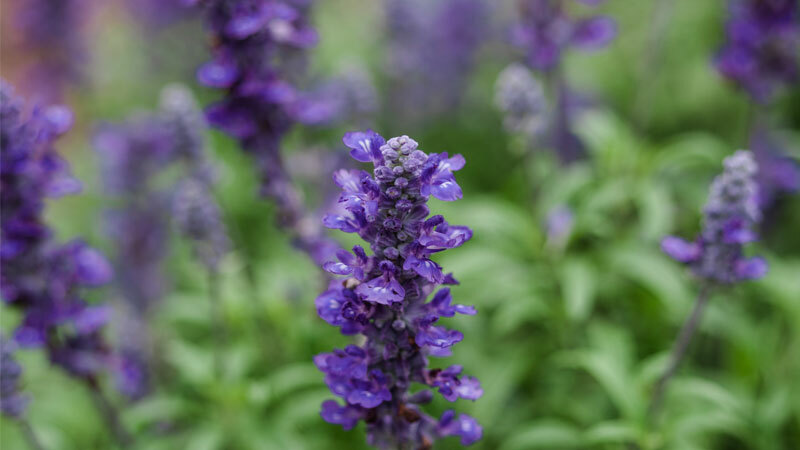 Spanish Lavender Sage (Salvia lavandulifolia or Salvia lavandulaefolia), also known as lavender-leaved sage or Spanish sage, is a small, woody, evergreen shrub belonging to the Lamiaceae plant family. It is native to Spain and southern France and is similar in appearance to garden sage but has narrower, greyish leaves and spikes of purple-blue flowers that resemble French Lavender. Spanish Lavender Sage essential oil is steam distilled from the plant’s flowering tops and leaves. It is a middle-note oil with a beautiful fresh camphorous, herbaceous aroma with woody undertones and a subtle hint of Lavender. It should not be confused with Dalmation Sage (Salvia officinalis) or Clary Sage (Salvia sclarea). Spanish Lavender Sage is a great multi-disciplinary aromatherapy oil. It is thought to be especially useful for supporting brain health and cognitive function (1) as well as being helpful for the nervous system, fatigue, stress, headaches, respiratory problems, muscle and joint and pain and hormone imbalance. It is also thought to support the liver which makes it a great oil to choose for a New Year’s detox. As a nerve tonic, Spanish Lavender Sage is great for calming and soothing anxiety, stress, depression, nervous tension and exhaustion. To de-stress and aid relaxation blend 3 drops Spanish Lavender Sage, 3 drops Geranium and 2 drops Rose with 15ml of bath base (or half a cup of full fat milk). Add to your bath water and feel the warming, comforting heat wrap around you, while taking the opportunity to breathe mindfully. As well as helping the nervous system, Spanish Lavender Sage is also cephalic, which means it is clearing and stimulating for the head! The oil is useful for tension headaches and for improving memory and cognition. It is a great oil to pop in an aromatherapy diffuser to aid focus and give your brain a boost – particularly when studying. Research conducted by the Human Cognitive Neuroscience Unit, Division of Psychology at Northumbria University, Newcastle upon Tyne found that Salvia lavandulaefolia essential oil enhanced the memory of healthy, young adults (2). Further studies have also been carried out to see if the oil’s properties could be beneficial in the treatment of Alzheimer's disease (3). To increase focus try diffusing 2 drops Spanish Lavender Sage, 3 drops Lemon and 2 drops Rosemary in an aromatherapy diffuser or candle burner for up to half and hour at a time. This is especially useful in the mornings to get your brain in gear for the day ahead! Spanish Lavender Sage oil has powerful anti-inflammatory, anti-spasmodic and pain-relieving effects that are great for sore joints and muscles. It’s a great choice for sports massage blends and for helping with joint pain and inflammation. To soothe aches and pains blend 2 drops Spanish Lavender Sage, 2 drops Sweet Marjoram and 3 drops Chamomile with 15ml of Sweet Almond Oil. Massage into affected areas in an upwards direction towards the heart. Spanish Lavender Sage has expectorant properties that can be helpful for thinning and loosening mucus in the respiratory tract during colds and flu. For adults, pop 4-6 drops of oil in a bowl of steaming hot water, then lean over the bowl with a towel over the head and inhale the vapor. Safety note: do not inhale directly if you suffer with asthma. Spanish Lavender Sage is thought to be balancing for the hormones, meaning that it can be helpful for fertility issues and menstrual problems including fluid retention. Try a balancing blend of 3 drops Spanish Lavender Sage, 2 drops Geranium and 2 drops Clary Sage in an aromatherapy diffuser or candle burner and diffuse for 10 to 30 minutes per day. Alternatively blend 2 drops of each essential oil with 15ml of Sweet Almond Oil and massage into the body daily after a bath or shower, working in an upwards direction towards the heart. For any skin issue which involves infection or excessive sweating, Spanish Lavender Sage is your friend! For an antimicrobial, deodorant skin spritz mix 15 drops of Spanish Lavender Sage, 10 drops Lemon and 10 drops Geranium essential oil with 100ml of Witch Hazel Hydrolat. Shake well before use and spray on as required. Ah, time for the January detox! If you’re looking to detox and cleanse your system after the recent festivities this oil is a good one to include in a cleansing massage blend. Mix 3 drops Spanish Lavender Sage, 2 drops Lemon and 1 drop Juniperberry with 15ml Sweet Almond Oil for a whole-body massage. Before applying the oil, brush your skin with a body brush, working in an upwards direction towards the heart. Then lightly massage the oil into your skin, working in the same direction. Doing this daily, coupled with drinking a cup of hot water with a thick wedge of fresh lemon (not essential oil, as these should never be taken internally) will help to support the body’s natural detoxification process. Clary Sage, Cypress, Geranium, Juniperberry, Lavender, Lemon, Rose, Rosewood, Rosemary and Sweet Marjoram. Use in very small amounts and avoid use with small children. Do not use while pregnant or breast feeding. Use with caution if epileptic. Overall, Spanish Lavender Sage is an extremely versatile oil that offers a gentler alternative to Dalmatian Sage. It is useful all year round, but particularly good in the New Year for cleansing, winter respiratory problems, aches and pains! Use it intuitively in your own beautiful blends and enjoy! Dorene Petersen, Presentation: Clinical Use of Aromatherapy for Brain Health: 7 Essential Oils. August 9, 2017, New Brunswick, NJ. Alliance of International Aromatherapists 2017 Conference. AIA 2017 Conference Proceedings page 221-222.